Either due to several reasons, your body starts making too little bone or you start losing bone. This results in a condition known as osteoporosis. Thus, Osteoporosis is a bone disease. Due to this disease, the bones become fragile, weak and can break even due to minor fall. In highly severe cases, the simple actions like sneezing forcefully or mere bumping into the furniture can lead to fracture or breakage of bone. The complete meaning of osteoporosis is porous bone. A healthy bone looks like a honeycomb when observed under the microscope. However, if you are suffering from osteoporosis the spaces and the holes within the honeycomb seem quite large that you can possibly see in a healthy bone. This shows that your bone has lost mass or density and the structure has become abnormal. Lesser the density of the bones, weaker they become thereby increasing the chances of bone breakage and fracture and the symptoms of osteoporosis. 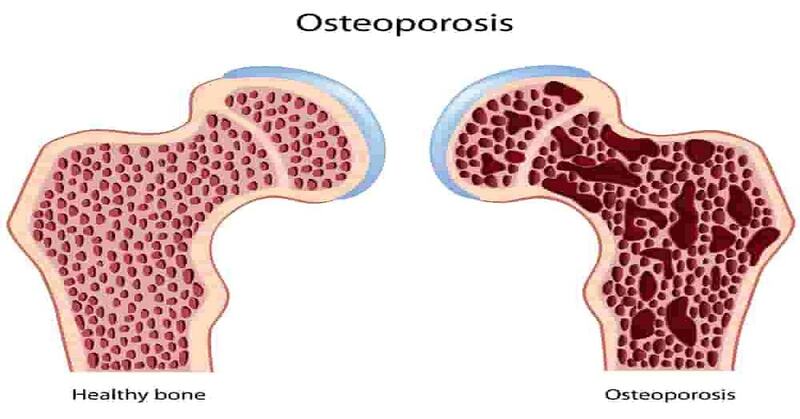 Osteoporosis is of different types and occurs in both men and women. However, certain races especially white women are more at risk of acquiring this disease. What is more concerning that lately the occurrence of juvenile osteoporosis has increased enormously. Both men and women tend to suffer from osteoporosis, however, the number of women suffering from this disease is comparatively more. Hence, by the time both are in their sixties both have lost the bone at the same rate, the bone loss is much more in women. The risk of osteoporosis in women increases after menopause. The symptoms of osteoporosis especially more in case of Asian and white women and to women who have small and thin frames. Even teenage girls with a thin frame and engaged in excessive exercise and not having regular menses are at risk of acquiring osteoporosis and such a condition is known as amenorrhea. This is because irregular menses or complete loss of menstrual periods is due to decrease in the level of estrogen, which can ultimately lead to osteoporosis. Low calcium diet devoid of bone-boosting nutrients can also lead to osteoporosis in women especially in girls who restrict eating for losing weight. Athletes and gymnasts who try to keep up low body weight for performing and scoring better in the tournaments are also at risk of acquiring this disease. Note: Around 30 percent of ballet dancers have been found to suffer from stress fractures because of low body weight and eating disorders. Men although are less at risk of acquiring osteoporosis than women, they still develop this condition. Men are at more risk of developing this condition after the age of 70, 5 to 10 years later than in women. Even though there is not a steady drop in hormone in men just like in women after the menopause, there is much reduction of testosterone, as men get older. Like estrogen in women, testosterone offers protection to the bones in the male body. Fracture: More often repeated fractures could be a sign of fragile bones caused because of severe osteoporosis. These fractures can occur even due to minor fall or step off from a curb or even due to a strong cough or sneezing. Losing Height: The patient can lose his height due to spinal compression fractures, which is one of the most noticeable and common of all the symptoms of osteoporosis. Due to the compression in the vertebrae, the upper back may also curve slightly giving a stopped appearance. This condition is termed as kyphosis or dowagers hump. This condition leads to severe pain in the neck and back and even affects the breathing as extra pressure is put on the airway. symptoms of osteoporosis in emergency can cause extreme discomfort and pain and warrant an emergency room trip. If you are suffering from extreme pain particularly in the wrist, hip, neck or back you must contact your caregiver immediately for evaluation of your bones and possible treatment. Bone fractures caused due to osteoporosis are highly painful and the patient loses workdays, quality of life and can lead to disability. Around 30 percent of the patients suffering from this disease suffer from a hip-fracture that requires long-term care and nursing. 20 percent women suffering from hip fracture due to osteoporosis die directly or indirectly due to this condition. Patients suffering from spine fracture as a result of osteoporosis are always at the risk of suffering similar fracture again in the future. Around 20 percent of the postmenopausal women with vertebral fracture experience earlier are at the risk of suffering from a bone fracture in the coming years.